Welcome to part one of our 'Supercar project'. This is more about building something that looks like a supercar than making a true supercar, but then looks are probably the best part of any supercar anyway. We don't want to copy any existing supercar design, though inevitably some aspects of this new design will remind people of other cars. 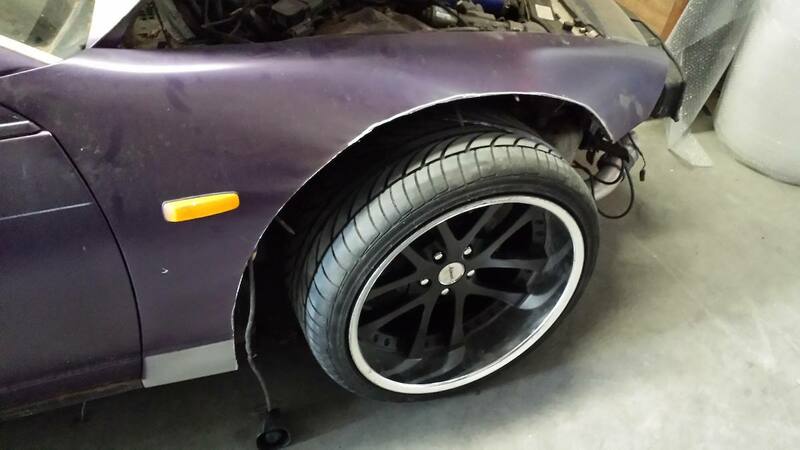 The car we chose to base the project on is a Nissan Z32 300ZX. The overall dimensions of the car, the low roof and heavily raked windscreen all contributed to the choice, along with its cheap price. We picked up this 1989 model twin turbo 2+2 (Fairlady Z import) for less than $3000. The plan is to build up the shape and make a 'plug' from this, then make moulds to produce the final panels. These will then be fitted to a better car wich will also receive performance and interior modifications to suit the Supercar image. The car came with some wheels we certainly don't want to keep, along with a fibreglass bonnet which won't be part of the final bodywork. 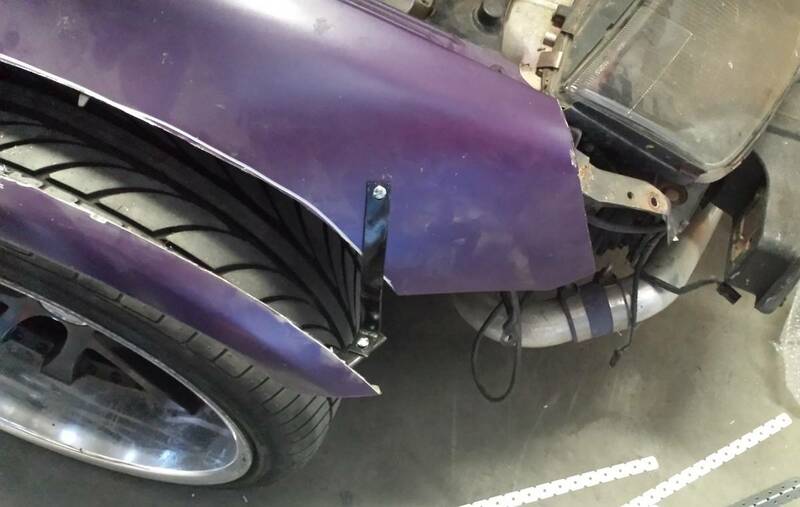 The existing side skirts (actually made by Trust) will be partly cut and used to support part of the new bodywork during the design phase. One useful modification is the lowered springs, which place the floor at about the same height we need for the final car. 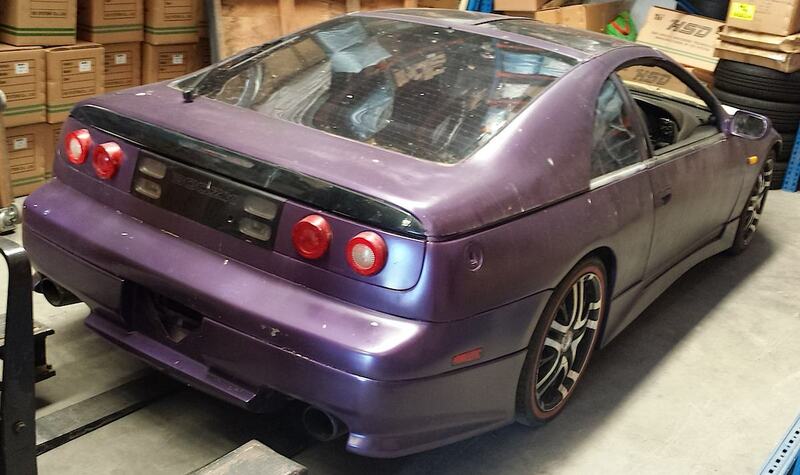 The Ferrari style tail lights were sold and the orginal bumper, reverse light panel and garnish were all removed. The tail lights we're using are aftermarket LED replacement lights meant for a Nissan Roox (JDM minivan). Steel straps were used to mount them in the planned positions. The next key change was fitting wheels that would suit the overall look we're going for. 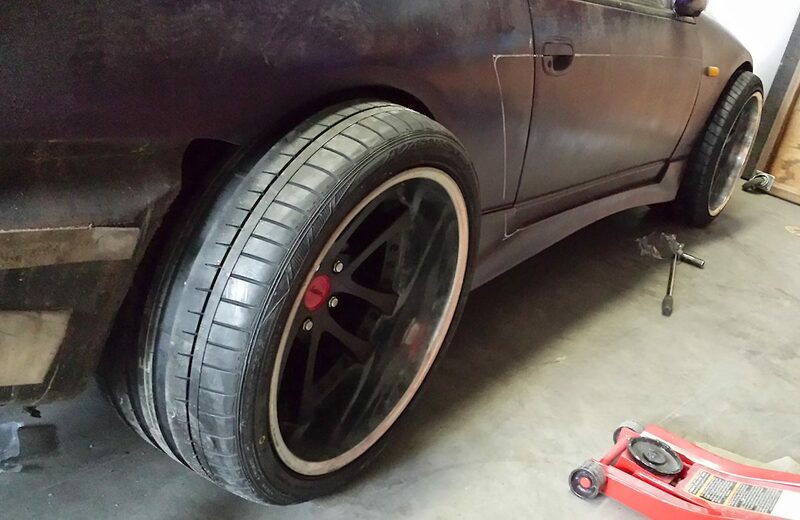 This set of used Weds Krenze wheels fit the bill, being 19x10 and 19x11 with a big negative offset. It still took 25mm spacers to make them sit this far out (for the final car we hope to source custom wheels that won't require the spacers). 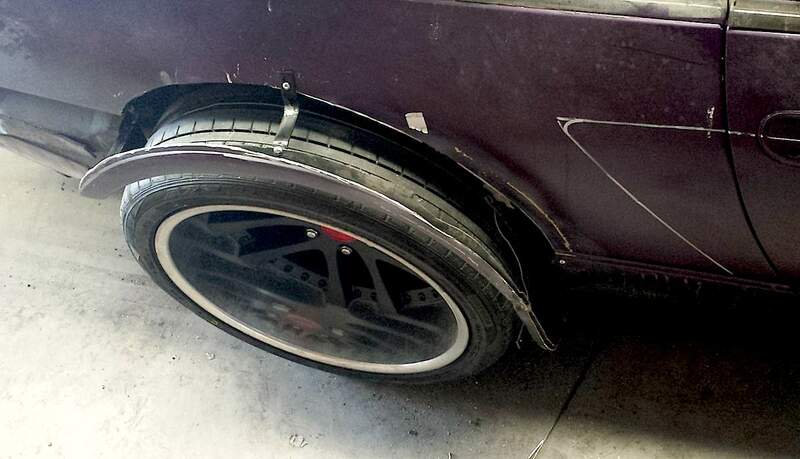 The wheels sit about 3 inches outside the guards at the front and four inches at the back. Tyres are 265/30 and 305/30. 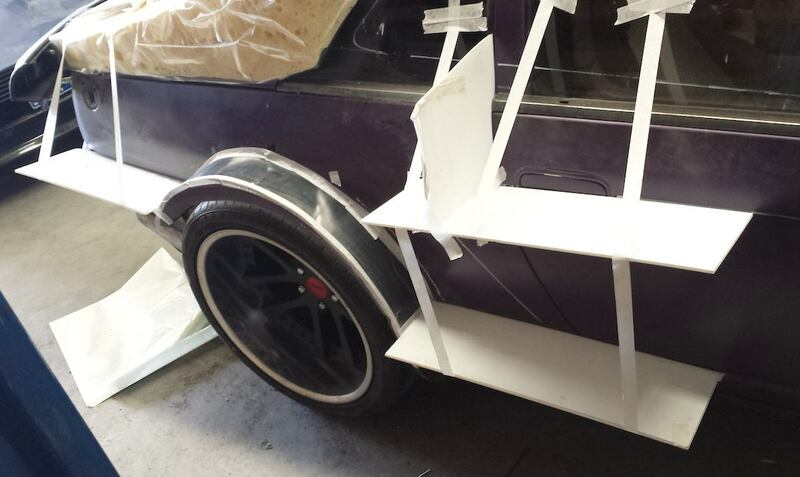 In this photo you can see an initial sketch of the side airscoops. Note how the line is level with the door handle, so it can be hidden by the built-out part but is still accessible by reaching underneath. 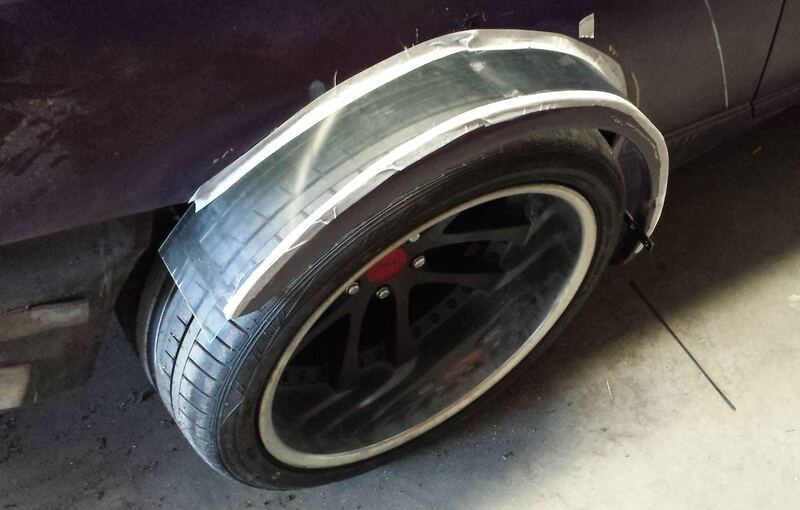 A section was cut out of the front guard and some testing done to ensure wheel clearance at full lock. A couple of items needed to be relocated to ensure no interference. The cut guard sections were then spaced out to establish the location of the wheel arch, with steel straps holding them in place. Note also that the front corner of the guard has been cut away, as it extends forward too far and curls around the headlight. To achieve a very different look without changing the headlights this had to go. The same procedure was used at the rear. This gives you a very clear picture of how much wider the car is. As the rear wheels don't turn the wheelarch can be placed a bit closer to the edge of the tyre. At the front we had to allow for bump travel while turning. A strip of polycarbonate was used to fill the gap. 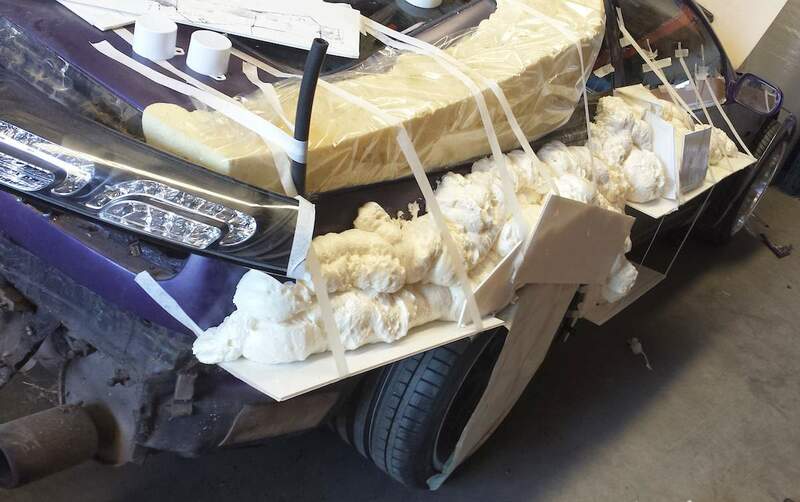 This was necessary to support the expanding foam we used for moulding the basic shape of the bodywork. Sections of corflute were then taped into place to support the foam and keep it out of the door jamb etc. 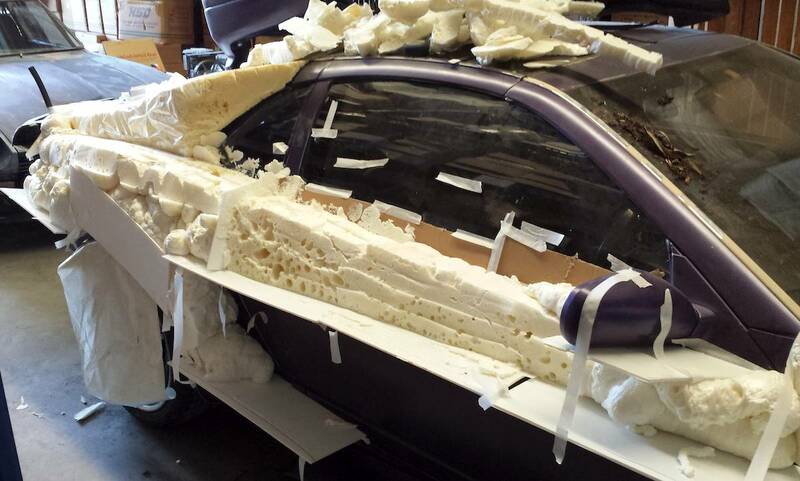 In this photo you can see part of the rear hatch foam has already beed completed. Also there are lines on the windows showing how high the foam will go. 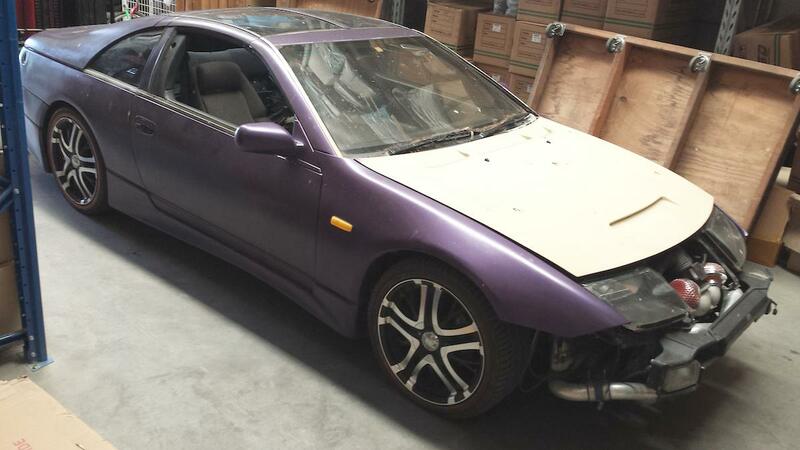 Disguising the normal wasteline and rear quarter window shape is essential to make this look like an original supercar design rather than simply a 300ZX kit. The foam is added in stages, to reduce the amount of mould-making needed. More bits of corflute held in place with masking tape are enough to stop it spilling over. Note the piece of heater hose sticking up behind the tail-light. This is to keep a hole for the factory radio aerial. After a couple of applications of foam we start cutting back the shape with a long knife blade (see all the scrap pieces piled on the roof). Already you can see where the shape is heading. See the next blog instalment for more progress.